In 2016 the Delos label has done sterling service to opera and song releasing individual recital albums from Jamie Barton, Lawrence Brownlee and Dmitri Hvorostovsky, three of the finest singers on the international stage today. American operatic mezzo-soprano Jamie Barton is fairly new to the scene. I remember her winning the prestigious BBC Cardiff Singer of the World competition in 2013 which she followed a couple of years later with her victory in the Richard Tucker Award at Lincoln Center, New York City. A rising star Barton seems as comfortable on the concert platform as the opera stage. 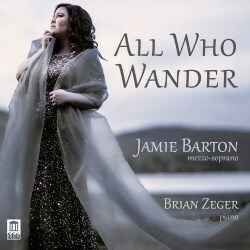 For her debut album ‘All Who Wander’ a recital programme with pianist Brian Zeger, Barton has chosen late-Romantic repertoire of a substantial Bohemian focus with works by Mahler and Dvořák. Her eight Mahler songs in German include the set of Fünf Rückert-Lieder and three songs from the composer’s earlier Lieder und Gesänge. Next come Dvořák’s set of seven song settings of Czech texts from Cigánské melodie (Gypsy Songs). Barton concludes the programme with the flavour of Scandinavia with six songs selected from Sibelius’s op. 36 and op. 37 sets with texts from the Finnish master’s beloved Swedish-language poets. In these art-songs admirable throughout is Barton’s alluring tone and gorgeous phrasing. My highlight is Mahler’s magnificent Ich bin der Welt abhanden gekommen (I am lost to the world) a multi-faceted score full of world-weary introspection. In this intensely melancholic writing Barton communicates a real sense of yearning to moving effect which felt extremely spiritual. The text that aches with emotion Um Mitternacht (At midnight) is enchantingly sung, maintaining an intense expression that adds to the dream-like quality of the writing and concludes with a sense of resignation. In the Sibelius songs Barton’s dusty low mezzo register is revealed together with the ability to change emotional temperaments with wonderful ease. Recorded at SUNY Purchase, New York the engineering team has excelled providing reasonably close, clear sound with a satisfying balance between voice and piano. In the booklet there is a concise note on the songs written by Jamie Barton together with sung texts and English translations. 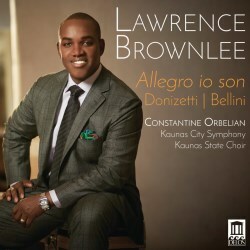 American tenor Lawrence Brownlee follows his 2014 GRAMMY nominated album ‘Virtuoso Rossini Arias’ with ‘Allegro io son’ another collection of Bel canto arias. From seven different operas Brownlee has selected arias by two master composers nine from Donizetti and two from Bellini. Firmly established on the international opera stage Brownlee made his professional debut back in 2002 as Almaviva in Il Barbiere di Siviglia. A bel canto specialist the tenor is in great demand singing predominantly Rossini roles. Brownlee made his Metropolitan Opera debut in 2007 singing Il Barbiere and has gone on to sing Almaviva in many of the world’s most renowned opera houses. As with his previous album there is no aria from Il Barbiere which is strange as the opera has been extremely providential for him. Brownlee describes himself as a high Bel canto tenor. He is a highly poised performer in remarkable form displaying his appealing tone, crystal-clear diction and outstanding voice control particularly in his top register. These Rossini and Bellini arias are loaded with fioritura demands and Brownlee meets the challenges by zipping up and down with fluidity and dashing off trills and ornaments in a sheer brilliant display of vocal pyrotechnics. My highlights: Ernesto’s aria Com'è gentil from Don Pasquale where he is serenading Norina to the sound of a mandolin, Brownlee excels with his richly lyrical and tender expression. Convincing too Tonio’s celebrated cavatina Ah! mes amis, quel jour de fête from La fille du régiment with Brownlee delivering the succession of high Cs with controlled ease. His line is exceptionally smooth with regular phrasing and a standard dynamic which all seem to come at the expense of some tonal variety and subsequently vocal character. The guest soloists have been well chosen and the Kaunas State Choir sings its heart out. Under Constantine Orbelian the Kaunas City Symphony Orchestra demonstrates a spirited sense of music making. Brownlee produced the recording at Philharmonic Hall, Kaunas providing fairly close sound that is clear and well balanced. There is a helpful note on the arias by George Loomis together with sung texts and English translations. World famous Russian baritone Dmitri Hvorostovsky with his unforgettable voice has been captivating opera and concert audiences since the mid 1980s. The flamboyant Siberian came to international prominence in 1989 with his victory in the BBC Cardiff Singer of the World Competition and since then has performed at all the major opera houses. In recent years Hvorostovsky has tended to undertake a substantial number of concert and recital appearances, and seems to pick his opera performances judiciously. 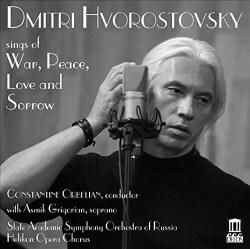 Not surprisingly for his new album ‘Sings of War, Peace, Love and Sorrow’ Hvorostovsky has turned to scenes and arias from five Russian operas by Prokofiev, Tchaikovsky and Rubinstein. Hvorostovsky is in terrific voice able to communicate his charismatic personality without damaging the sense and dramatic impact of the text. Technically assured throughout I marvel at the baritone’s rich tonal warmth and expressive range. Exceptionally fine is the first scene from War and Peace set after dark, focusing on the recently widowed Prince Andrei, played by Hvorostovsky, who overhears Natasha and Sonya in conversation. Hvorostovsky demonstrates his secure control and appealing expression creating a convincing portrayal of the bereft Prince’s spiritual renewal and thirst for life. Taking twenty-six minutes here the final track on the album scene 6 and epilogue from Rubinstein’s The Demon is one of the most moving and memorable opera scenes I have heard for some time. Hvorostovsky as the tormented Demon in love with Tamera is in irresistible form giving a sensuously, radiant performance which generates a remarkable ethereal atmosphere. Soprano Asmik Grigorian makes a moving Tamara, dramatically convincing and showing lots of potential. Hvorostovsky’s guests sing their parts splendidly especially soprano Asmik Grigorian and the Helikon Opera Chorus is in fine voice too. Constantine Orbelian phrases and paces well, generating significant drama from the responsive State Academic Symphony Orchestra of Russia ‘Evgeny Svetlanov’. Fairly close recorded at the Mosfilm Studios, Moscow Hvorostovsky has the benefit of warm sound, good clarity and balance between voice and orchestra. These are three captivating and well presented albums on Delos with Jamie Barton, Lawrence Brownlee and Dmitri Hvorostovsky all demonstrating their remarkable voices to wonderful effect. It’s hard to select just one but with my arm twisted it will be Hvorostovsky’s Sings of War, Peace, Love and Sorrow.